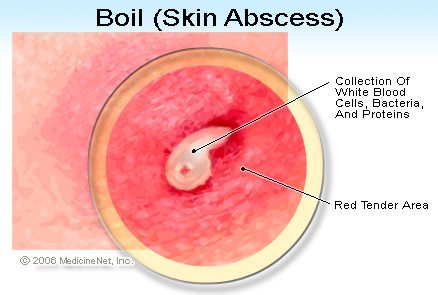 Boils, also known as abscesses, are defined as painful lumps filled with pus, white blood cells, and bacteria. These lumps form under the skin when one or more hair follicles becomes infected and inflamed by bacteria. Boils can develop on any part of your body. The pus inside the boil is a thick fluid made up of bacteria, dead tissues, and white blood cells. Boils usually begin as red lumps that grows larger with time and becomes more painful until the pus drains out of it. 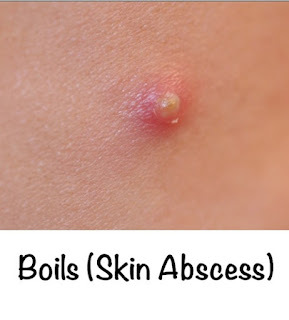 Boils often occur on areas of the skin that have hair like armpits, face, neck, buttocks, and thighs, they can also develop inside the body between two organs. Ultrasound is essential to locate boils inside the body. Sweat and friction within the skin is a contributing factor to boils. The symptoms of a boil include red swollen skin around the lump, increase in size over time, and a yellow-white tip that bursts and allows pus to get out. A connected area of infection with a number of boils is called carbuncles. The bacteria that causes boils is Staphylococcus, a bacteria often found under the skin and inside the nose. 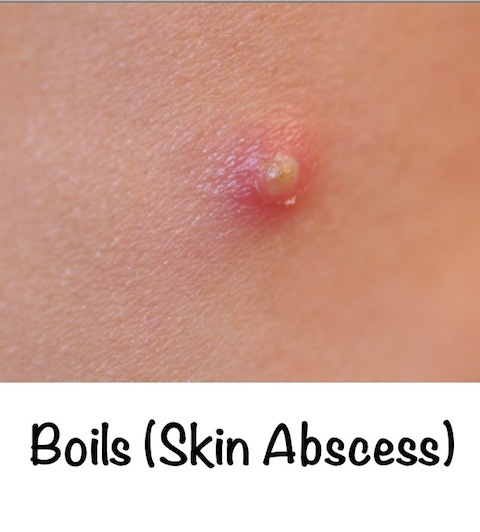 Boils can also be caused by insect bites or a small cut that allows bacteria to enter the body. Turmeric-Its blood purifying properties help get rid of the pus, hence the boil. Put one tablespoon turmeric powder in a bowl and mix it with warm milk or water. Drink this mixture 3 times a day for 3-4 days. Turmeric can also be mixed with ginger and made into a paste that can be applied on the boil, cover with a clean cloth after application.